The beautiful scenery of Mills Falls along the Mersey River in Kejimkujik National Park in Nova Scotia which flows over historic rock cliffs. Cascading over the unique rockery made up ancient African slate rock, Mills Falls flows over the various tiers where it shows its force as it swirls around the rocks. This waterfall is displayed along the Mersey River in Kejimkujik National Park in Nova Scotia, Canada, a park filled with cultural heritage, a main reason it has been declared as a national historic site. Mills Falls is surrounded by wilderness but the falls are easy to access along the hiking trails. The trail to reach the falls starts at the visitors center and is about 1.0 kilometers in length, a hike which takes approximately 30 minutes. The Mersey River is an ideal location for kayaking or canoeing, but people should be warned that there are areas where the water becomes too dangerous or shallow. It is not uncommon to have to travel a little ways along the river banks to get back on track and re-enter the river to continue exploring Kejimkujik National Park in Nova Scotia. 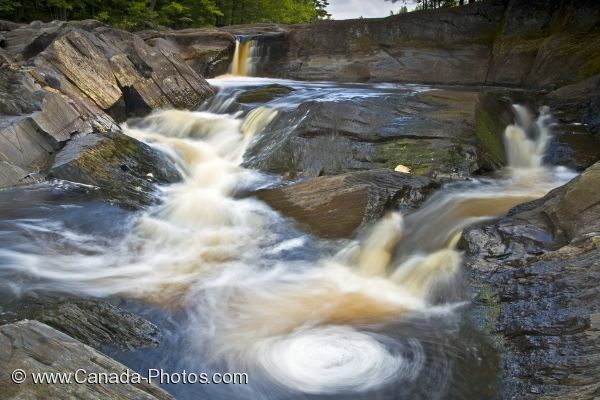 Picture of the water swirling around the rocks at Mills Falls along the Mersey River in Kejimkujik National Park in Nova Scotia. Mill Falls along the Mersey River in Kejimkujik National Park and National Historic Site of Canada, Kejimkujik Scenic Drive, Highway 8, Nova Scotia, Canada.